Hexham Photographic Society are pleased to announce that our 2018 Summer Exhibition opened this evening, 13th August and will be open daily until Sunday the 26th August. 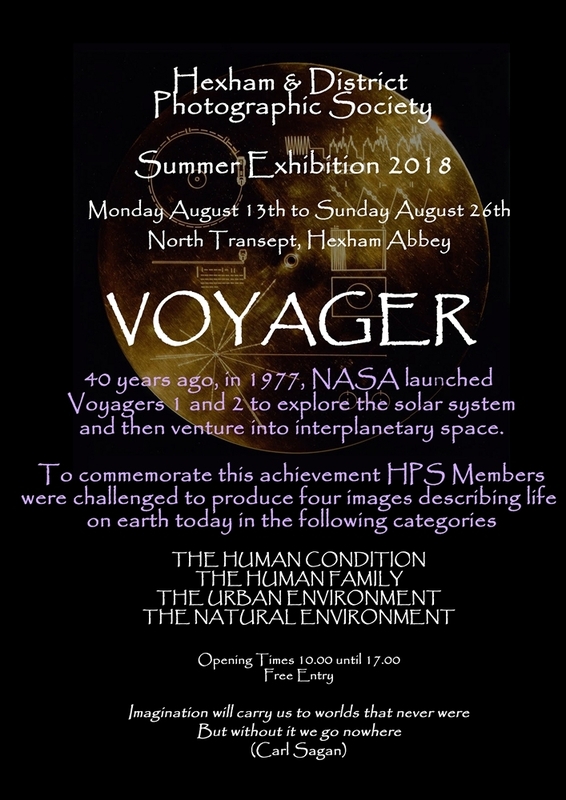 The theme of this years exhibition is VOYAGER, to commemorate the 40th anniversary of the launch of Voyager 1 and 2 on a mission to explore the solar system. To each of the probes was attached a ‘golden record’ containing a message from earth for any extra-terrestrial intelligence that might encounter these messengers. Included was a library of images, encoded in audio format, to give a visual snapshot of our planet and civilisation, a limited glimpse of daily life, the built environment, cultures, landscapes, flora and fauna. If you are interested to see how members have responded to this challenge why not call in to visit the exhibition in the North Transept of Hexham Abbey. The exhibition is free to view and will be open Daily from 10:00am with last admission being 4:30pm, we look forward to seeing you.